We are working on some great surprises for you. One ticket buys brunch AND a show! Brunch menu to be announced soon. Profits from this show benefit The Beer City Sisters, Abbey of All Souls 501(c)3 as they help Asheville's other non-profits including WNCAP, Loving Food Resources, Youth OUTright, Blue Ridge Pride, Brother Wolf, and others year-round. Upcoming brunches will benefit Youth OUTrightWNC and more! Asheville Drag Brunch is the littlest big show in town! The event is designed to showcase local and guest drag queens, promote local restaurant businesses, and support local organizations. The show happens at multiple venues, is fast-paced family-friendly fun, and is designed to raise funds for non-profit organizations. These local groups rotate and are advertised with each individual show. A ticket to brunch ensures a seat at a table or bar, the meal, and a beverage. Remember to bring tips for the queens as this is the main way they raise additional money for the local non-profit. During the glitter-adorned affairs, patrons howl, clap and cheer as the queens channel celebrities with spot-on lip syncing and sky-high heels. And wherever you look, there is cause for celebration. Lively groups — of different genders, races and ages — whoop it up for all sorts of special occasions, from birthdays to bachelorettes to anniversaries, and even divorces. Come grill out with Queer Night Out and Beer City Sisters! Bring a side dish and what you want to grill! Pets(on leash) and kids welcome! Join us for Communion Sunday!!!!! Communion is a special comedy drag service to rejuvenate your soul during times of celebration and times of need. Beer City Sisters, Abbey of All Souls created Communion to seek to inspire, uplift, inform and challenge the community to be good stewards of Universal Joy. The program is rich and varied, including offerings by a variety of entertainers (some of which may be irreverent and downright offensive!). "IF YOU GET EASILY OFFENDED, THIS IS THE PLACE FOR YOU TO BE" come and join us in Communion. Service starts at 6pm and "worship" at 8pm. NO COVER FEE!!! Banks Ave. Bar will donate 10% of their sales to the Beer City Sisters, Abbey of All Souls. Indulge on the Seven Deadly Sins portrayed by your lovely Beer City Sisters. Enjoy the beats of DJ Devan Balsam. Great performances and many surprises to come. A Halloween Party like any other. Costume optional (no masks). Proceeds to benefit the Beer City Sisters General Fund. 'Tuck It Up Buttercup' is a Drag & Dancing spectacle you must see! Music provided by Eric Stephens (DJ RexxStep) and emcee Margarita Del Encanto with Beer City Sisters, Abbey of All Souls bring you a night of interactive drag and dance music to fill your needs! With an ever-changing lineup, each event will blend well-known, established queens with up-and-coming queens from the community and surrounding areas. Join us for Communion Sunday!!!!! Communion is a special comedy drag service to rejuvenate your soul during times of celebration and times of need. The Beer City Sisters, Abbey of All Souls created Communion to seek to inspire, uplift, inform and challenge the community to be good stewards of Universal Joy. The program is rich and varied, including offerings by a variety of entertainers (some of which may be irreverent and downright offensive!). "IF YOU GET EASILY OFFENDED, THIS IS THE PLACE FOR YOU TO BE" come and join us in Communion. Service starts at 6pm and "worship" at 8pm. Banks Ave. Bar will donate 10% of their sales to the Beer City Sisters, Abbey of All Souls. First night of auditions for "Not Just a Sister Act: Extravaganza"
Show us your hidden (or not that hidden) talent for a chance to win $500 cash. Auditions every 3rd Sunday of the month during August, September and October. Join Asheville's Tasteful Queer Troupe for another night of Party Foul at the Odditorium. The Beer City Sisters presents their 1st Underwear Glow Party benefiting Youth OUTRight. Performances by Priscilla Chambers, Natasha Nightly, Ida Carolina, Toothless Prissy and our own Sister Margarita del Encanto and Sister Peri Van Winkle. It's the Beer City Sisters 1th Birthday and we are throwing a Fundraising Carnival Extravaganza. Come and join us at OHenry's Asheville for a night a fun, games, treats, music, dance, and more. All proceeds will go to our General Fund to help us keep helping our Community. Beats by DJ Deven Balsam and performances by Ginger Von Snap, Priscilla Chambers, Ida Carolina and our own Sister Margarita del Encanto and Sister Peri Van Winkle. Presented by Fire Beads; the summer's counterpart to the successful and fun Winter Court fashion event. Featuring runway and live performance. Designers include Jon Pierce Fashions, Foxfire Custom Designs, Amanda Rose, Fire Beads, Royal Peasantry, Howard Kaplan with Barter Theatre Costume Shop and KatDog Couture. Special guests Wicked Geisha, and The Beer City Sisters. Original score for the runway portion of the evening by Deven Balsam. Tickets are $20 and $5 of each ticket sold gives each guest a chance to win a raffle. Raffle benefits a local charity and is organized by the Beer City Sisters. Every year a new miss BRP is crowned. But not often are they given the opportunity to actually make a statement with their reign as the queen. As a public figure in this community I want to use my reaches for good. Come celebrate all the Blue Ridge Pride is and help give back to the community that has been so good to us! There will be tons of opportunities to win awesome prizes. Games, food, and even a drag show! All money raised and proceeds collected goes completely to BRP and WNCAP! Come and join us during OHenry's Monthly Potluck and we will take care of your car's filthy habits and was away it's sins. All proceeds from this event will benefit Youth OutRight. What a better place to salvage our Pride after a difficult year for the community. Join us at the Salvage Station for a family-friendly afternoon by the river as we enjoy a little local entertainment for a relaxing summer afternoon. June 24, from 2:00 pm to 7:00 pm. Early parking is available for groups wanting to bicycle,paddle,float,run to the Party. The entertainment will begin at 3:30 pm. We will host a brief presentation and discussion at 2:15 pm, About the future of Blue Ridge Pride and the Festival in September, We have been giving it a lot of thought, Now we'd like to know what You think, "Comming Together with Pride for a Purpose"
party FOUL is a group of queer individuals based in Asheville NC, who's mission is to keep WNC Queer and Weird! We want to create a safe space for all walks of life to come together and get freaky! Catch us at the Odditorium on the first of every month! Saturday June 3rd, party FOUL will be making an appearance at the Odditorium! 2 hours full of drag, drinks, and FILTH ;) This event is 18+ and encourages everyone of all walks to come out! Come out and have a real QUEER time with us! See y'all there! The Hope Center Nigeria is a humanitarian organization based in Nigeria that rescues LGBT individuals who face 14 years in prison just for "acting" gay to worse, they can be killed by a family member! Eric Swope-Wise is the Founder and Director of Hope Center Nigeria and is a resident of Asheville. He is back from Nigeria to share this important work with you! Ednas will be hosting a Drag Quen Bingo fundraiser on Thursday May 25th at 7PM to raise funds for the Nigerian compound that provides refuge to LGBT individuals who are persecuted! On Easter Sunday the Sisters of Perpetual Indulgence celebrates their Annivesary. This year will be no. 38th. 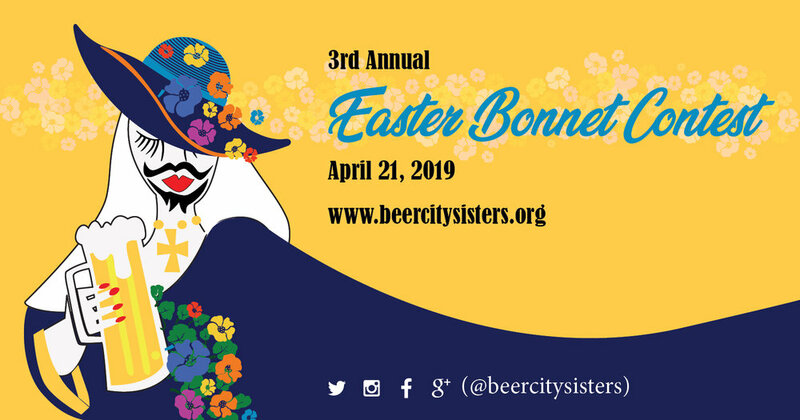 The Beer City Sisters will join the celebration this year with the 1st Easter Bonnet Contest. We will have performances by Sister Margarita del Encanto and many more. Beats by DJ Rexxstep, drawings, silent auctions and pictures with our Easter Bunnies. Get your bonnet on and come and celebrate with us. Join us for the 3rd edition of this Tasteful Queer Troupe. Sister Margarita will be performing!!! The Beer City Sisters is hosting a night of Talent Extravaganza! Everyone is welcome to join and perform at Asheville's Gay Bar, OHenry's. Music, Dance, Drag, Magic, Comedy... no matter what's your talent, if you want to share it, you are welcome! OHenry's will be giving a prize to the winner and we are honor to have DJ Deven giving the beats to the night. Fire - Safe Space LGTB Dance Party is hosting the official after party of Condom Couture at OHenry's / The Underground. Sister Margarita and Bear Tonight Jr will be performing with beats of DJ Deven. $3 cover / $1 going to Planned Parenthood. Fire LGBT Safe Space brings its first Latin Night to the Underground. Drag show and guest performers tba. $5 cover.